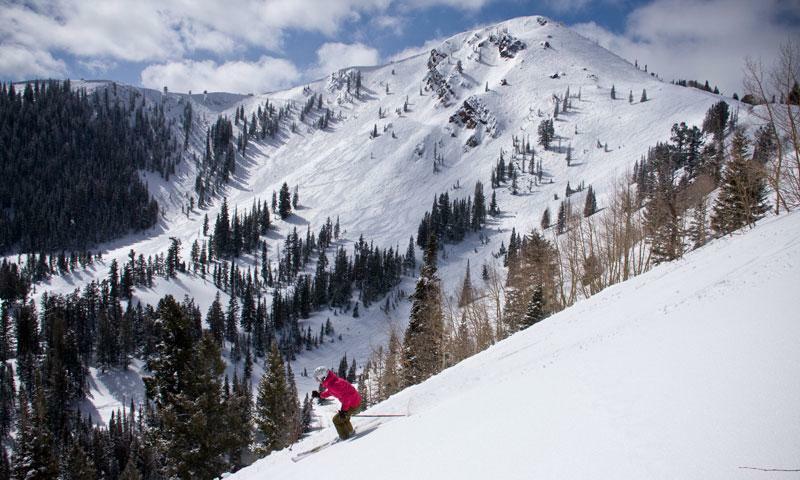 Park City, Utah, is home to world-class skiing on three distinctive ski resorts. With a combined 9,326 acres, 426 runs, bowls, terrain parks and 58 lifts, there's something for everyone from toddlers to seniors, skiers to snowboarders. You can talk all you want about the crazy parties and apres scene at other ski resorts but when it comes to terrain quality, choice and consistently epic snow conditions Utah has no rival. Families with a mix of skiers and boarders love Park City's namesake- Park City Mountain Resort. The area has over 3,300 acres of bowls, bumps, trees and groomers. The mountain boasts the largest superpipe in the country but the four terrain parks draw an international crowd. Stake out the King's Crown Terrain Park and you might spot pros like Shaun White and Tanner Hall pulling their latest maneuvers. PCMR is one of the first to be tracked out when the big storms come but with wide runs and soft crud you'll play all day without complaint. Though not as steep as its neighbor, Deer Valley Resort's powder stays hidden a bit longer. Most of the intermediate skiers (no boarders are allowed) stick to the groomed runs and avoid the off-piste like a child near the deep end. Whether you trek over to Empire Express and Lady Morgan lifts or choose the trees off Ontario, you're bound to find a stash no one's touched- especially if you're skiing during a storm. Everything at Deer Valley screams "class!" From the valets who take your skis from your car to the complimentary tampons in the ladies' rooms and friendly lift operators who make sure the chair doesn't slam into the backs of your knees. DV limits their ticket sales during holiday periods so make sure you purchase the afternoon before if you plan to ski there. The Canyons Resort skews younger. They offer one of the best season pass deals for students, youths and local Chamber Bureau members so if you want to feel like a Parkite plan on a day or two at The Canyons. The gondola has moved to a more central location and that should make it even easier to access the 3,700 acres. The resort is at the lowest elevation of the three areas but it still gets a fair share of powder. And the runs are loooong. The resort is actually a network of eight peaks so choose your terrain wisely or you might spend your day trekking from one place to the next without really skiing. Experts race to 99/90 for the steeps but intermediates will be in blue heaven over at the Dream Peak and the new Iron Mountain area to the south. The National Ski Areas Association assits ski areas with safety and marketing issues. Read quarterly articles about the history and tradition of skiing.